The Delhi Bride's Guide To Wedding Shopping In *Shahpur Jat* - All You Need To Know! “Apni shaadi mein main bhi Sabyasachi wala lehenga pehnungi” Hasn’t every Indian bride-to-be wished for this at least once? Whether you are scrolling through gorgeous but unaffordable designer wear on your social media feed, or are swooning over a real bride’s beautiful designer lehenga at a wedding, the price tag is always a heartbreaker! We get it, wedding shopping can be difficult, especially when you want to be able to see a wide variety in one place instead of criss-crossing the length and breath of the city. There’s a great neighbourhood in Delhi that combines that magical combination of variety, not-run-off-the-mill, and affordable prices. Most fashion lovers have seen Shahpur Jat as a shopping district for bohemian and artisanal designer wear, whereas actually, we found great wedding wear and accessories in the quaint bylanes of this heritage village. Our ultimate shopping guide to the area’s best stores will help you navigate perfectly. Go on, scroll down to find out all about these stores… Who knows, you might even find the outfit of your dreams! The talented designer duo has a thing for pastels, but we’re not complaining. Their gorgeous designs come with tassels, ruffles and subtle bling that gives it such a fairytale vibe. If you are looking to don a hatke colour on your D-day, then Monika Nidhii’s creations would be ideal. Given that they have great lehenga gowns and ghararas, you might even find something apt for your sangeet or cocktail. Gazal Gupta’s designs are all about glitz and glamour. The one thing that stands out among all her designs is the generous use of heavy latkans. She doesn’t have a fixation with any colours in particular, so you’ll find outfits of all shades here. This is an ideal place for the bride who wants her wedding outfit to be extravagant and absolutely gorgeous at the same time. Preeti S Kapoor is synonymous with gorgeous shararas. She does some stunning shararas in bright colours and flowy fabrics, complete with gorgeous embellishments and embroideries. Great pick for a or mehendi outfit and for your wedding trousseau. If you love everything quirky and colourful, then Liz Paul is the store for you. You will find some bright coloured patchwork and floral lehengas (with stunning and delicate belts!) at this store. Since her designs are mostly light coloured, we think it will be a great pick for a day function. 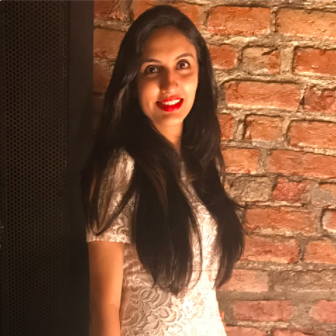 Or if you’d like to experiment, then there are some pretty options that’ll make for a cool sangeet or even a cocktail outfit. If you want your trousseau to have delicately embroidered but delightfully eclectic pieces, head to MadSam TinZin. You’ll find sarees, traditional lehengas and contemporary outfits, all under one roof. The store has some beautiful designs that work very well for sangeet or mehendi functions. Apart from that, you can also pick some pretty sarees for your trousseau from this store. Although Kyra is a designer store, the cutest thing you’ll find here are colourful eye masks for the bride and bridesmaids. So, apart from all the gorgeous lightweight lehengas, stunning shararas and embroidered kurtas, you can also pick some really adorable wedding favours for your besties from this store. You’ll love the contemporary edge Devnaagri gives to Indian wear. Apart from lehengas and sarees, they also design some beautiful plain kurtas that’ll be perfect for those in- between shaadi functions and post-wedding rituals. Check it out, you will love it! Outfits all set? Great! Here’s something more you could look for while shopping at the bridal shopping haven! When in Shahpur Jat, do not forget to visit PRUNE for some happy floral jewellery pieces. We bet, you’ll not step out of the store without picking something for yourself. They even customize jewellery according to your dress and taste, which is really cool. Not just the bride, but even bridesmaids need to visit the Needledust store. It’s literally a jutti heaven! You’ll even find gorgeous embroidered juttis embellished with mirrors and ghunghroos. What’s more, they are comfortable and can be worn post your wedding too. This was the first store in India to offer customized wedding shoes, both for brides and grooms. If you are looking to add a specific design or phrase embroidered on your juttis, you can get it done here! TSG has some pretty amazing designs and we’re sure you’ll be able to pick your perfect pair here. This is probably the best jewellery store for the badass bride. If you’re looking for some quirky jewellery for your wedding day or any other function, then you should definitely check out Nimai. P.S. We can’t but tell you about this delicious stop for lunch when you’re out shopping in Shahpur Jat: The Pot Belly! A cosy little rooftop restaurant that serves the most amazing Bihari cuisine in the city. It’s a must visit if you want to fuel up on amidst all the retail therapy. Oh and while you're still here, do check out our Chandni Chowk wedding haul too! 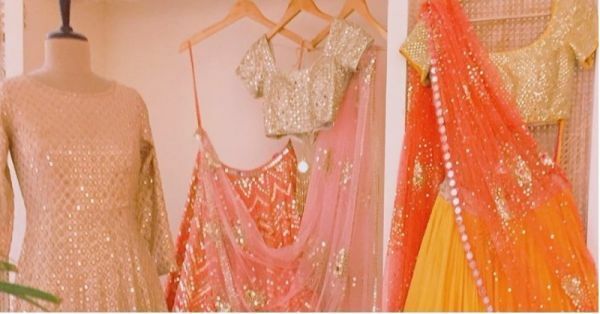 We hope this detailed guide to wedding shopping in Shahpur Jat will help you choose the best outfits for your trousseau. Happy wedding shopping!